Josh and I spent April discovering neighborhoods in Jakarta and our own city, eating our way through several restaurants with delicious food, shopping at some of Indonesia’s best malls, and of course keeping extra busy with plenty of overtime at EF. 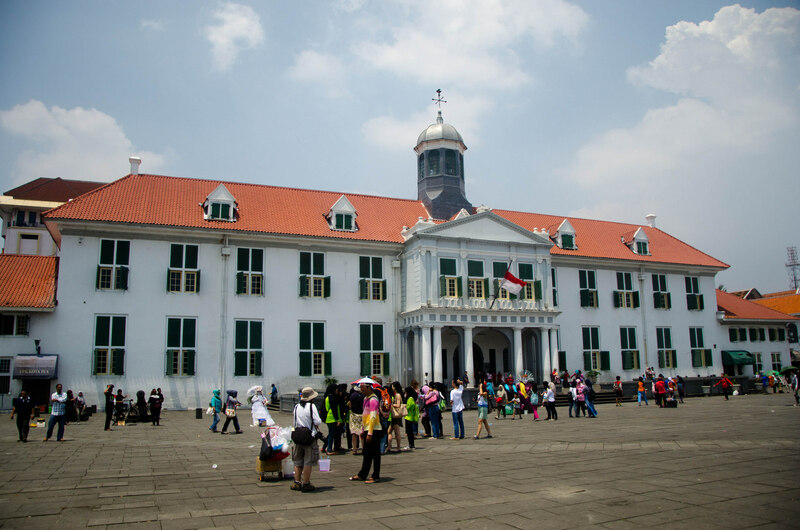 One of the few areas of Jakarta that has historic value is Kota Tua (Old Town). I’ll be writing a separate post about this soon, but given the reputation that Jakarta has here, I was certainly surprised when we arrived at this place and saw how quaint this area leftover from the Dutch colonial era was. 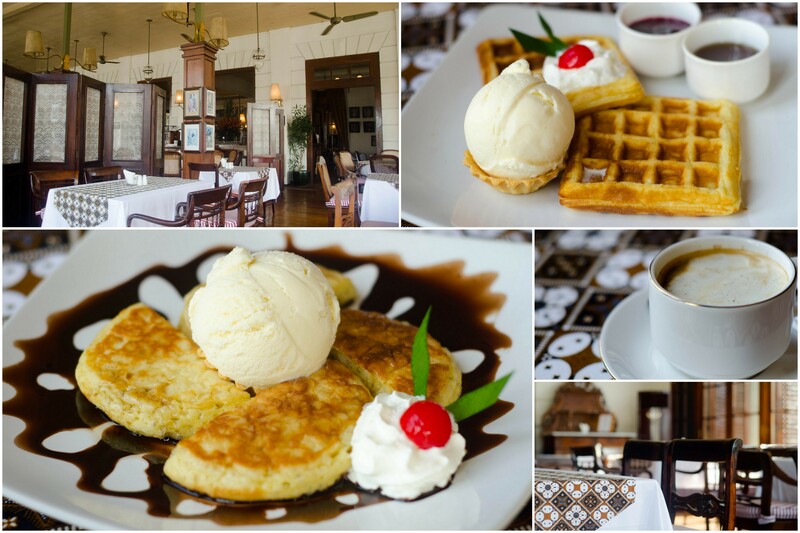 Josh and I spent a morning visiting the museums and breakfasting at the famous Cafe Batavia. Another new neighborhood was in our own city, though still a 40-minute drive from home. We were stunned to discover Karawaci’s cute cafes, neat sidewalks, an English bookshop, and no litter in sight. It’s unfortunate that such a nice, clean area is an oddity in Indonesia, but we’re still glad to have found a nice place to spend time on weekends. On a related note, going out so much has meant that I’ve gotten to know my way around our own neighborhood better–the road layout in Indonesia is extremely convoluted, and we have yet to meet a taxi driver who has heard of our housing subdivision, let alone knows how to get there. And while my Indonesian language skills are still shaky, I’ve gotten pretty darn good at giving directions home. 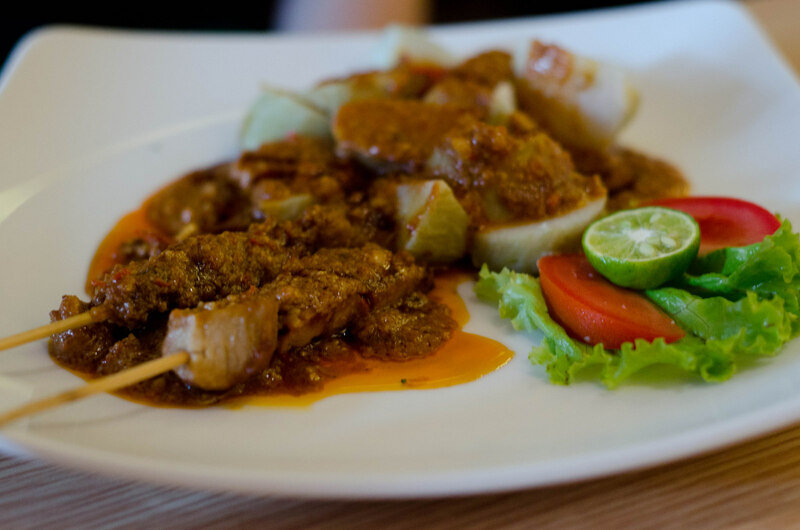 Despite the fact that Indonesian food incorporates far more vegetables than American or European food, it’s still a struggle at times to find vegetarian food, especially given that there are some people here who don’t even understand what that means. Even so, we stumbled on some amazing restaurants this month. Dharma Kitchen, located in two of our favorite Jakarta malls, has an entirely vegetarian menu, including veg versions of western and Indonesian dishes. Josh and I have been there multiple times to gorge on the most amazing “chicken” satay. While at the aforementioned Cafe Batavia, we opted to indulge our sweet tooth with waffles and pancakes. It was a place that could get away with selling water for $5, and perhaps its costliness was the reason Josh and I were the only customers in the whole place that morning. Regardless of the fact that Josh had to sell a kidney for us to pay for our meal (I jest–our breakfast was only slightly overpriced), we felt that it was still great value given that we loved the atmosphere. A big-band version of “Over the Rainbow” played as we sipped our coffee and waited for our food, and in that moment, I felt that Jakarta was pretty okay. In Karawaci, we discovered a tiny little Indian restaurant called Taal, which has pages upon pages of veg options. My friends and I used to have Indian food Sundays together in Cincinnati and now I’m glad that I have a place to re-start that tradition with Josh. 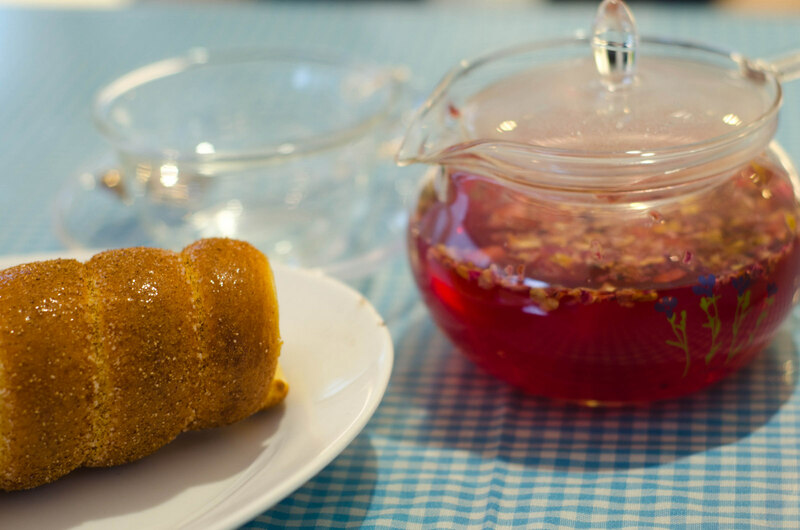 And a few doors down from Taal is the positively perfect Lady Alice Tea Room, where I was surprised to find a pastry that I hadn’t seen anywhere since my trip to Eastern Europe. Josh and I didn’t mind having fallen into this rabbit hole as we snacked on the cinnamon sugar chimney cake and sipped strawberry rose tea while admiring the cafe’s Wonderland decor. Jakarta is full of trash, pollution, and traffic, and it’s not really a city that caters to tourists. But one thing it does do well is malls. From giant warehouses full of individual vendors to opulent buildings full of the world’s biggest brands and designers, there is no shortage of shopping in Indonesia’s capital city. 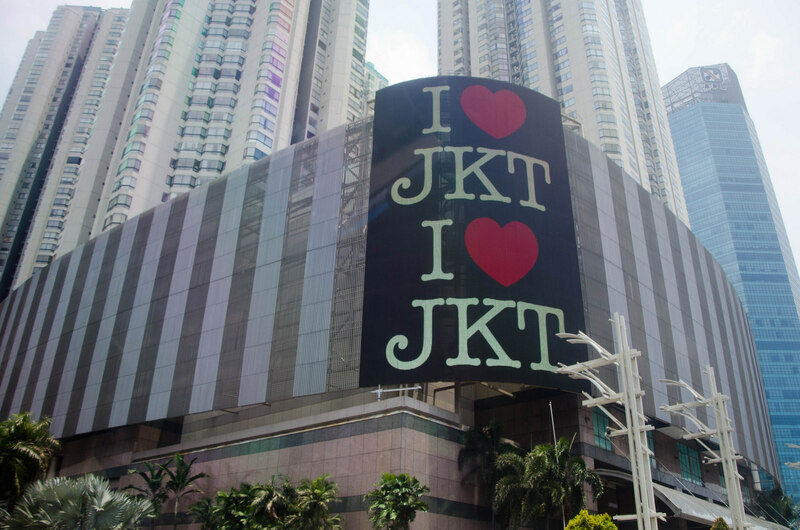 In April, Josh and I spent time in more than a half-dozen new malls in Jakarta and Tangerang. 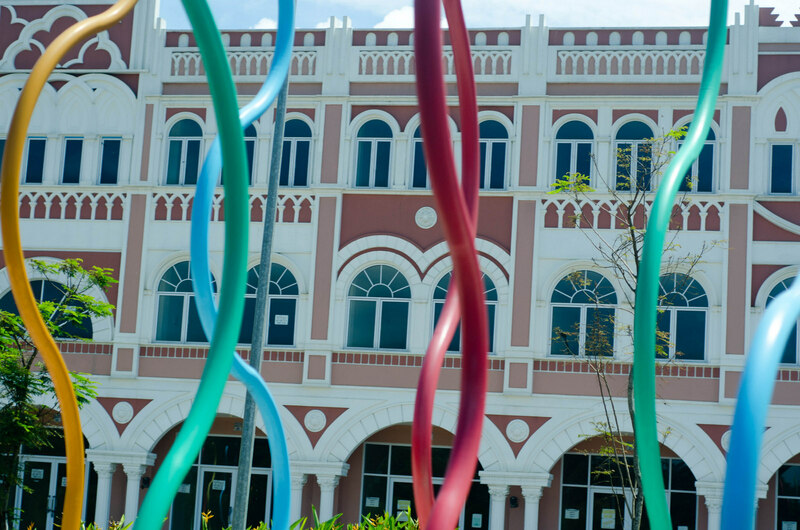 Having heard good things about Central Park Mall and Orchid Garden Mall, we spent an afternoon wandering through the two, which were conveniently located next to each other. Central Park was unique because of the outdoor park that was attached to it, and Orchid Garden had an ice rink. Both of the malls were mind-bogglingly massive, though Orchid Garden carries the title of largest mall in Indonesia. In Karawaci, we were impressed to discover that the mall there houses its own little amusement park, complete with a roller coaster. Elsewhere in Tangerang, we went to a mall called SMS for the grand opening of Josh’s favorite store, Uniqlo. With its high-end shops, including favorite brands from around the world, SMS is almost universally hailed by all as the best mall in Tangerang, and we could see why, especially after discovering that there were probably close to a hundred restaurants in a beautifully-lit outdoor area–colorful paper lanterns stretched between the canopies of restaurants, which lined a pathway that went on for what felt like close to a mile. When Josh and I moved to Indonesia, neither of us realized that living in the city would mean spending so much time in malls, but at least we have some interesting ones to choose from! That’s all I have to share for now. I’ll be writing another post soon about some interesting experiences I’ve had in the classroom during April, but until then, I hope everybody’s May is off to a great start!